“No More Hell to Pay” is Stryper’s eighth original studio album. Produced by frontman/guitarist Michael Sweet himself, the set features some of Stryper’s strongest and heaviest material ever. 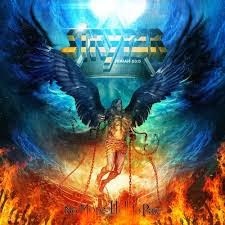 Sweet commented: “The new Stryper album, No More Hell To Pay, is the record we needed to make as a follow up to 'To Hell With The Devil'. Every song has a hooky guitar riff. Everything is in minor keys, so it's a little darker sounding and a little tougher. It's definitely our heaviest record and I think people will be pleasantly surprised. To reference, there is less songs like 'Calling On You' and more songs like 'To Hell With The Devil'. It's more in that vein than the poppier vein." All I can add to that is, thank God! I loved Stryper in the 80s. Yes they were seen by many as a novelty band, but when they were heavy, bugger me there weren’t that many who could touch them, because in Michael Sweet they had one of THE finest rock vocalist ever to grace a stage. 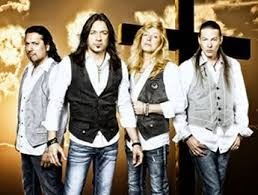 Stryper is one of the top Christian rock bands of all time. 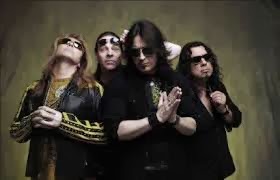 Comprised of the original line-up of Michael Sweet (vocals/guitar), Oz Fox (guitar), Tim Gaines (bass), and Robert Sweet (drums), Stryper has been rocking since 1984, and is responsible for such '80s metal classic albums as SOLDIERS UNDER COMMAND, TO HELL WITH THE DEVIL, IN GOD WE TRUST and such MTV hit singles/videos as "Calling on You," "Free," and "Honestly." After a sabbatical for much of the 1990's, Stryper returned strong in the early 21st century. To date, the band has sold upwards of 8 million records worldwide and is a Dove Award-winner and Grammy nominee. Stryper is the first band to have two songs in MTV’s Top 10 simultaneously. The God botherers have been pretty active these past 10 years, with (including compilations and live albums),eight albums, with No More Hell To Pay, their fifth in just six years! Bills have to be paid people! So, thankfully the schmaltz has gone. No-one did ballads like Stryper. But for me they always upset the flow of some great tunes. Whereas with the new opus, Hell To Pay has had all of the pink fluffiness removed and the end result proves to be Stryper’s heaviest, most consistent, and possibly their best album to date. They certainly chose a great title track to open their campaign, and reminds me a little of Queesnryche’s Take Hold Of The Flame (I did say a little), and has some great vocal dexterity from Mr Sweet. Only once do they get blatantly close to ‘Preachy’ and that’s on “Water Into Wine’ and ‘Jesus Is Just Alright’, the latter a hit by the Doobie Bros in the US in the 70, and is a song that’s been covered by many. They hit the full metal onslaught with ‘Legacy’, as song that would have many an old or new metal band chomping at the bit for. Cynics will take the piss, but it’s a face-melter and a half. Chunky riffs, and a metal-esque chorus to boot. ‘The One’ is the only track that comes close to a Styper ballad, and even that’s nowhere near as mushy as anything from their past. ‘Marching Into Battle’ harks back to the days of Yellow & Black Attack only with a meatier production. A lot of 80s bands have come back to reminisce, but not Stryper, who have taken their successes from their earliest albums, and cranked the heaviness up to 11, and in doing so have pushed their own boundaries further than they thought possible. NMHTP without the sway of a major label has thrown Stryper’s hat into the ring for a top 5 contender come the end of 2013. Since the band reformed mid 200s its one resurrection that’s been well worth the wait. Legacy; Marching Into Battle; Te Amo; Sticks & Stones; Water Into Wine; Sympathy; Renewed.